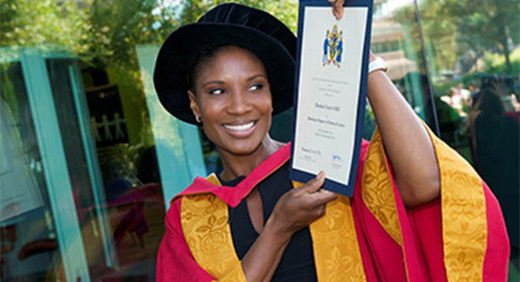 Denise received an Honorary Degree of Doctor of Letters from the Faculty of Education, Health and Wellbeing on Monday, 8 September, recognising her sporting success and charity work. She established the British record of 6831, was inducted into the UK Athletics Hall of Fame in 2011 and in July 2012, carried the Olympic Flame on its Torch Relay across the UK. Since her retirement in 2005, Denise has continued to be actively involved in athletics, writing for the Telegraph and becoming a highly respected commentator for BBC Sport. 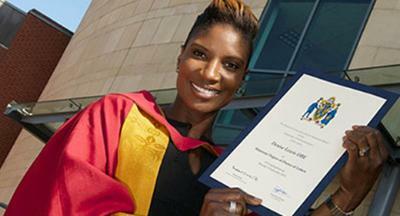 2012 saw Denise join the BBC’s London 2012 broadcasting team. Denise presented various films for the BBC Inspire Olympic magazine show in 2013, and will continue to do so throughout 2014, including the Commonwealth Games and looking ahead to Rio 2016. Denise has undertaken various television work; BBC One’s Strictly Come Dancing in which she was runner-up, a guest on Radio 4’s prestigious Desert Island Discs and competing for charity on The Cube, All Star Family Fortunes and BBC One’s Pointless. Charitable work is close to Denise’s heart and she works closely with the Jaguar Academy of Sport, Breast Cancer Care and Unicef as both Patron and Ambassador. In 2012, Denise undertook the gruelling challenge of rowing the Channel with John Bishop, Davina McCall and Andrew Flintoff, an impressive feat that raised £3.4 million for Sport Relief. She again joined Davina for another formidable cycling challenge for Sport Relief in 2014. Denise has also been elected as the 2014 President of SPARKS children’s charity.